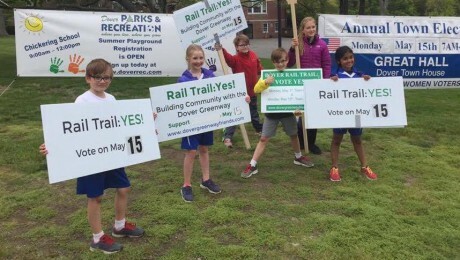 Another hurdle cleared and much more work to do, but today we simply express heartfelt gratitude to our community for the strong vote in support of the Greenway at last night’s town meeting. Thank You! The most frequently heard questions and misconceptions about the proposed Dover Greenway are addressed. It’s been forty years since the Dover demon was first spotted on Farm Street. Its whereabouts and habits have remained a mystery since then… Until now!!! Kevin Ban explains why the greenway makes good sense for our vibrant community. Please read the article and take the online poll here. April 18, 2017 in Media, News and Events. April 14, 2017 in Greenway Highlights, Media. April 13, 2017 in Media, News and Events. The Dover Greenway would provide multiple benefits to our community. Read our March 2017 newsletter to learn more. March 14, 2017 in Greenway Highlights, News and Events. Dover Greenway in the Press! May 5, 2016 in Greenway Highlights, Media, News and Events. Dover residents with ALL levels of ability need an accessible trail! May 2, 2016 in News and Events. Members of both The Friends of the Dover Greenway and Be True to Dover met this week and discussed Article 18. Please read this letter carefully, as all sides are trying to be constructive and respectful to each other’s positions. April 28, 2016 in News and Events. The Vestry at St. Dunstan’s Episcopal Church is officially supporting the Dover Greenway! We are VERY excited to announce that the Vestry of St. Episcopal Dunstan’s Church has officially made a statement supporting the Dover Greenway. Thank you!! !